Kristin Karolina dressed her Yuletide lads in sheepskin and wool of her homeland. Mischief is written all over the bearded faces of the “bad boys,” presented here in groups of three and four. Gryla, the witch, and Ragamuff, her lazy husband, are waiting in their cave on the mountain for the return of the thirteen lads. The Christmas scene, in style and materials identical with the other figures, is set apart, and highlights the deeper meaning of the Yuletide tradition. The Story of the Yulemen Yuletide of the North of Europe is not simply Christmas. Long before the Christian era, it meant the joyful moment when the sun, after having been a prisoner of darkness for too long, slowly but surely reasserted its right to light and day. What better symbol to highlight the meaning of Christ’s birth, frequently compared to the rising sun? The folktale of the Icelandic Yuletide lads links both these events. The ballad of the Giantess Gryla (18 c.) speaks of thirteen lads coming down from their snowy mountains, one each day. On Christmas day, they leave again, one at a time, the last one departing on Epiphany. Who are these Yuletide lads? They are “bad boys” who like to have fun at the expense of innocent people. The children better hide their toys, and kitchen maids cover their pots and pans for the Yuletide lads are a greedy lot. They are taking after their parents, Gryla and Ragamuff, “loathsome folks who played on humans many a hoax.” Unbelievable but true! Gryla, the giant witch, collected children in her awesome bag. No wonder the lads are pranksters with an evil streak. Fencepost Pat , the first to come, always scares the sheep. Gully empties the milkpail. Shorty, with the long white beard, steals the whole pan laden with meat. Ladle Licker likes to lick the porridge ladle. Pot Scraper adores what is crisp or burnt. Skirt Blower makes people sick blowing a breeze. Door Banger likes to make noise. Yoghurt Glutton as the tale says, empties “barrel, bowl, and plate,” even before people awake. Sausage Snatcher is after the row of juicy sausages. Window Peeker has an evil eye, and Doorway Sniffer hides behind closed doors: both of them have sticky little fingers. Meat Hook steals the Christmas steak with rod and hook, right up through the chimney. The last to come on December 24 is called Candle Beggar. He sweeps the holiday candles wherever he can get them. Come December 25, the feast of new light, the spooky guys disappear, one a day. On January 6, the thirteenth day of Christmas, they are all gone, the hissing yuletide cat on their heels. The mischief is now over, light has triumphed over darkness. The days grow longer, and Jesus’ birth is announced to the whole world. 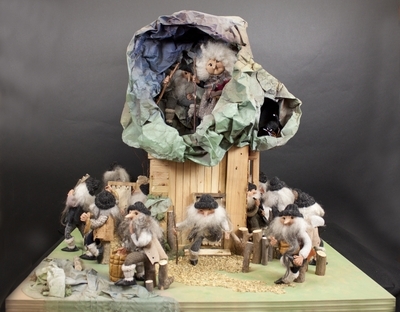 Figures made from knitted wool and sheepskin depicting the nativity of Jesus, created by Kristin Karolina in 2003 in Kópavogur (Iceland). Exhibition label originally written by Fr. Johann G. Roten, S.M. for exhibit entitled "At The Manger" and held at Roesch Library, University of Dayton.